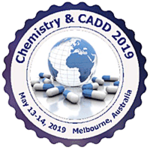 On behalf of Chemistry Congress 2019 organizing committee, conference series LLC Ltd invites Chemistry and Chemical researchers, professors, scientific communities, delegates, students, business professionals and executives to attend the “12th Global Experts Meeting on Chemistry and Computer-Aided Drug Design” which is to be held during May 13-14, 2019, at Melbourne, Australia. Chemistry Conferences is a global platform to discuss and learn about Chemistry Congress 2019 which covers all areas of Chemistry and mechanisms of Computer Aided Drug Design. The Chemistry Congress 2019 is designed in a very optimized way and a special attention has been laid on making it one of the top technology-oriented International conference. The members of our Organizing Committee have constructed the theme and the tracks in a very precise manner and made it revolve around recent trends, advancements and emerging technologies in the field of chemistry along with some graphic oriented techniques leading to the customization in the mechanisms of Drug Discovery and Design. All in all, continuing the legacy of last ten seasons, this season of Chemistry congress also promises to be the best fit for all those intellect and aspiring minds living with chemistry and looking for a further drill in this concept to explore themselves and add on some lifetime experience by sharing the mutual participation with some of the world's leading chemists in one of the world's most beautiful city, Melbourne, Australia. In the light of this theme, Dynamic evaluation of Chemistry domains with a customized approach towards Computer-Aided Drug Design. aims to provide a forum for international researchers from various areas of Chemistry, Pharmacy, Life sciences and allied groups by providing a platform for critical analysis of new data, and to share latest cutting-edge research findings and results about all aspects regarding advances in various branches of Chemistry. Chemistry Congress 2019 focuses on all aspects involved with the substances of that matter consists the investigation of their properties and reactions, and also the use of such reactions to make new substances. The conference provides the analysis works of chemistry experience from numerous scientific backgrounds and also the same is often perceived by young researchers and students. Chemistry Conferences chiefly aims to promulgate information in analysis and advances in chemical techniques. Each life sciences and chemical sciences want chemical techniques in course of analysis work and thus Chemistry Meeting would be an ideal venue to share and develop information on key chemistry tools. We provide the opportunities to Health Centre, pharmaceutical companies, hospitals, research centers, authors, associations, etc. to sponsor/exhibit at the conference. Come and join us at & be Part of Chemistry Congress 2019...! !